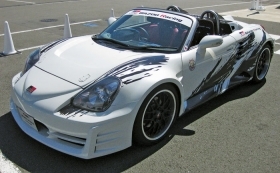 Since debuting in Tokyo in January, an open-cockpit hybrid concept based on Toyota's MR2 has tantalized buffs yearning for something brawnier in the company's lineup. I finally drove the car around the grounds of Fuji Speedway this month. This is what people have in mind when they think sporty hybrid. The specs of Toyota's ride speak for themselves: a 3.3-liter V-6 engine with all-wheel drive. The 0 to 60 mph time is reportedly 4.5 seconds. And it's a convertible. The hybrid concept is still too obviously a concept. But Executive Vice President Takeshi Uchiyamada says Toyota is working on a sporty hybrid and wants to offer one. No promises, though. Until then, keep an eye on the affordable sports car, the FT-86, due in 2012 as a joint project with Subaru. Any chance of Toyota's version getting a hybrid option?